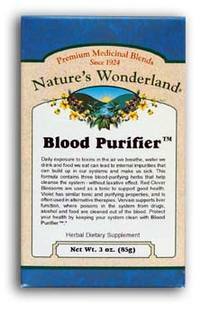 Blood Purifier™ Tea, 2.5 oz each (Nature's Wonderland) - Penn Herb Co. Ltd.
Blood-Purifier™ is a powerful systemic detoxification formula that helps cleanse the system without a laxative effect. The three-herb blend of Red Clover, Blue Violet Leaves & Vervain, removes toxins and supports the liver's cleansing action. Blue Violet Leaves…promotes the body’s own cleansing action and supports healthy lymphatic function. Red Clover Blossoms…gentle detoxifier enhances the cleansing action of the liver and promotes clear complexion and healthy-looking skin. Red Clover Blossoms, Violet Leaves, Vervain Leaves. Non-laxative detoxification formula supports healthy liver, lymphatic and kidney functions; promotes healthy skin. Pour 8 oz of freshly boiled water over 1 heaping teaspoon of tea. Cover and allow to steep 4-7 minutes, then strain. Drink 2-4 cups daily. To enhance flavor, add honey, stevia and/or lemon to suit your personal taste. NOT TO BE USED DURING PREGNANCY.